Barrel: Schneider heavy stainless steel. Features: Action completely hand honed and hand fitted. Barrel: McMillan match-grade, heavy contour. Stock: McMillan fiberglass; adjustable for length; recoil pad. 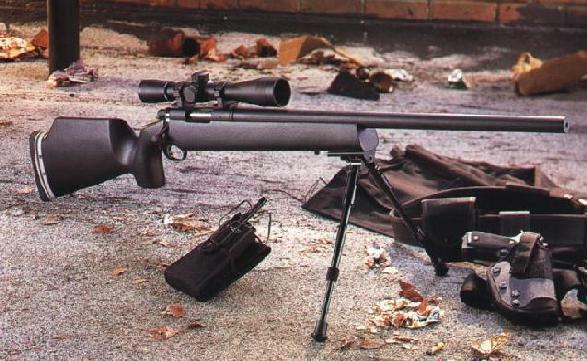 Features: McMillan repeating action, bipod. Barrel: 24″ Stainless Steel Heavy Contour, Match Grade. Stock: McMillan fiberglass, black, grey or camo, pillar bedded. Feed Mechanism: 20 round detachable box magazine. Stock: Black synthetic AR-15A2 design. Full floating forend of glass-reinforced synthetic attaches to upper reciever at a single point. Sights: None provided, Integral Weaver-Style rail provided for scope mount. Trigger: Modified AR-15, fully adjustable for over-travel and sear engagement. Stock: Composite Brown Precision Tactical with 3-way adjustable buttplate/recoil pad assembly. Features: Based on custom tuned Rem 700 action, Shilen select match grade heavy benchrest stainless steel barrel, Black teflon finish, customer choice of trigger pull, optional muzzel break. Trigger: Adjustable, set at 2.5 lbs. 3 swivel studs, and Parker-Hale stype bipod spike. Chamber: Match spec with .001 head space. Stock: McMillan Fiberglass (Sako Varmint), Aluminum pillar bedded. Trigger Pull: 2.25 – 2.5 lb or to Spec. Stock: McMillan Fiberglass (McHale), Aluminum pillar bedded. Trigger Pull: 2.5 lb or to Spec. Trigger: Two-stage; adjustable for length, pull, horizontal or vertical pitch. Aluminum base stock attached with polyurethane forestock. Polyurethane buttstock with aluminum skeleton. Fully adjustable cheek piece (height, windage and pitch). Fully adjustable buttplate (distance, angle, height and pitch). Advanced stock design for right and left handed shooters. Independently removable trigger assembly and trigger guard. Double-stage trigger pull adjustable from 1 to 2.5 kg (2 to 5 lbs.). Also adjustable in length and vertical or horizontal pitch. Silent safety catch inside the trigger guard. Safety locks the trigger mechanism and the bolt in closed position with firing pin blocked from the primer. Three massive locking lugs, 60 degree bolt lift. Receiver fastened by three fastening screws. Without open sights, auxiliary folding peep sights for emergency use. Integral 17 mm dovetail on the top of the receiver for optical day and night sights. Heavy free-floating hammer-forged barrel; deeply blued. Available also in stainless steel. 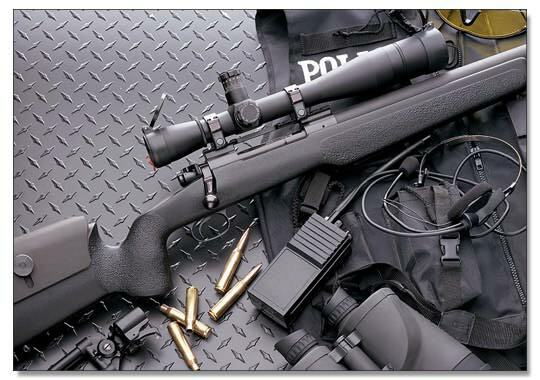 Extra accessories include, e.g., muzzle brake/flash-hider, silencer (.308 Winchester), foldable bipod, match sight mounting set, night sight adapter, different slings and swivels, cleaning sets, heavy-duty transit case. In 1999 the TRG-21/41 was replaced by the new TRG-22 and TRG-42. These rifles have a new stock design that has a little better contour. They also have some other minor changes and improvements, helping to further refine this excellent rifle. All data below is for the rifle tested here. There are many options for these custom built rifles which can change the specifications. Sight Integral Scope base and 1″ rings included. Barrel Length: 22″ (559mm) .223 Rem, .308 Win. 20″ (508mm) on test rifle. Price: $1015 – $1045 MSRP.